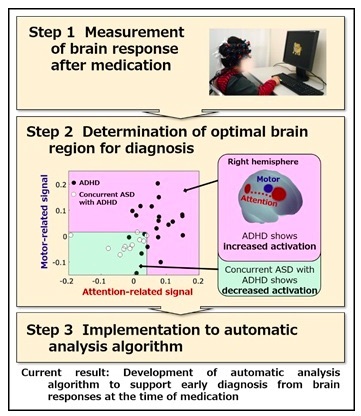 TOKYO, 11 February 2019 -- (JCN Newswire) -- Hitachi, Ltd., Jichi Medical University (JMU), International University of Health and Welfare (IUHW) and Chuo University (Chuo-U) have developed fundamental technology to support the early differential diagnosis of concurrent autism spectrum disorder (ASD) in patients with attention-deficit hyperactivity disorder (ADHD). 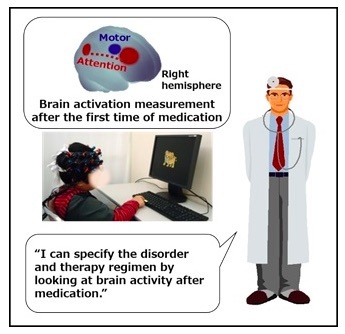 The technology automatically analyzes the presence or absence of concurrent ASD when an ADHD patient takes their medication for the first time, by using optical topography to measure brain response. The condition can be predicted with a confirmed accuracy of about 82%. Attention-deficit hyperactivity disorder. https://www.psychiatry.org/patients-families/adhd/what-is-adhd A common mental disorder affecting children, although it is also found in ######. Characteristics include inattention, hyperactivity and acting impulsively.